Webcam Zone Trigger can be used for security, but also for art, QA testing, automation, statistics acquisition, DIY projects, science experiments... Its unique features make it ideal for custom projects. Hot Spots - A reliable way to detection motion in a precise zone on the image. Set the size of the hot spot, move it over the area to monitor on the video, and the software will produce an action when it detects motion in this zone. You can setup many Hot Spot with independent actions. 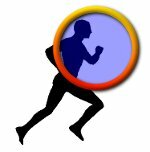 Triggered Actions - Tell the software how you need it to behave when it detects motion. For example, it can record stills and video, run programs, send email, use FTP, count, play sound, emulate mouse or keyboard, even output a signal to an external device. What are the differences between Standard and Pro mode? When starting the trial software, you get to choose "Standard" or "Pro" mode. "Pro" has all the options available in Standard mode, plus it handles multiple cameras at the same time, it has mode motion detection Hot Spot types, and it has a full-screen mode. How Many cameras can be connected at the same time? Webcam Zone Trigger can handle as many cameras as the computer can support. So ultimately it depends on how fast the computer is, and the video capture resolution you have selected. Define "General Purpose" motion detection. 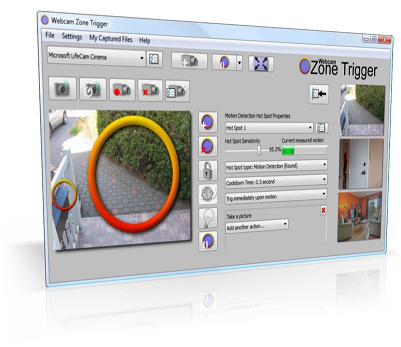 Motion detection is usually associated with security, but the Zone Trigger software uses Motion detection Hot Spots that can be used in many creative ways, making this software useful for creative computer-vision projects that other software can't handle. Can this software be used as a security system? Yes, it works fine for monitoring, notification via email, saving and uploading images. It can display many cameras in a security style scheme and it can sound alarms. If I buy the software, how do I get it? You get a license in the form of a serial number key. You will need to download and install the trial version from this website, then unlock the full version from the trial using the key. Check out our motion detection project example video page.